“But understand this, that in the last days there will come times of difficulty. For people will be lovers of self, lovers of money, proud, arrogant, abusive, disobedient to their parents, ungrateful, unholy, heartless, unappeasable, slanderous, without self-control, brutal, not loving good, treacherous, reckless, swollen with conceit, lovers of pleasure rather than lovers of God, having the appearance of godliness, but denying its power. Avoid such people. For among them are those who creep into households and capture weak women, burdened with sins and led astray by various passions, always learning and never able to arrive at a knowledge of the truth. Just as Jannes and Jambres opposed Moses, so these men also oppose the truth, men corrupted in mind and disqualified regarding the faith. But they will not get very far, for their folly will be plain to all, as was that of those two men. – 2 Timothy 3:1-9 (Emphasis Added). “The coming of the lawless one is by the activity of Satan with all power and false signs and wonders, and with all wicked deception for those who are perishing, because they refused to love the truth and so be saved. Therefore God sends them a strong delusion, so that they may believe what is false, in order that all may be condemned who did not believe the truth but had pleasure in unrighteousness.” – 2 Thessalonians 2:9-11 (Emphasis Added). As the light of God’s Word continues to be snuffed out in churches around the globe by men and women who have an “appearance of Godliness” but are really wolves in sheep’s clothing, the world continues to grow darker by the day. People in churches are no longer hearing repentance and the forgiveness of sins through Christ’s death and resurrection. Instead, their heads are being filled with folly by men and women who masquerade as Christians and they’re BELIEVING IT because these “Christians” are refusing to open their Bibles and compare what they’re being taught to the Word of God. Katherine Ruonala of Glory City Church: Amanda Wells’ Zedekiah. When false teachers take over the church, who do they hate the most and start labeling as evil? Christians. Why? Because Christians (disciples of Christ) are called by God to expose false teachers in the church. The bible commands them to test their sincerity of their love to Jesus Christ and to each other. The Christian message of “repentance” is unbearable to fakes and unregenerate men and women. So when false teachers like Amanda Wells get sprung of committing atrocious acts of sin, who do you think she will attack first? Obviously any Christian who take the writings of Jesus and His Apostles very seriously. This is evident in her rantings. Over the course of these past few days, we have had brief conversations with only four “prophets” from the Elijah List despite the fact that we messaged them all privately. Here was our conversation with Amanda Wells. We sent her the below private message on November 4th, giving her plenty of time to privately deal with this and publicly come clean. Amanda Wells responded later that day on November 4th. Although we have scrutinised her unrepentant response, we would like to point out the fact that Amanda Wells NO PROBLEM IGNORING God’s Law! Though evidence of her plagiarism is undeniable, instead of repenting of her sins, she has dug in her heels and accused everyone else of “slandering and attacking” her. We will critique the above “cupcake” episode in our next article on Amanda. In the mean time, we ask you to pray for the Ahab List Elijah List. Just like in 1 Kings, it was the multitude of false prophets and their false prophecies that destroyed King Ahab. The Christian is like faithful Micaiah, faithfully proclaiming the word of the Lord and exposing fraud and sins among men. Amanda Wells is nothing but a “Zedekiah,” only she does not know how to slap us. Please pray for everyone on the Elijah List to repent for blaspheming God by attaching His name to their made up delusions, for defending a plagiarizer, and for leading people to Hell with their doctrines of demons. Pray they will turn from their sins and be forgiven by Christ’s death and resurrection on cross. Christ died even for those grievous sins. Even if they will not repent of their evil ways, pray for God to silence them so they can no longer lead people astray from the truth of the saving grace of the Gospel. Australian Prophetic Council’s Facebook page as well. 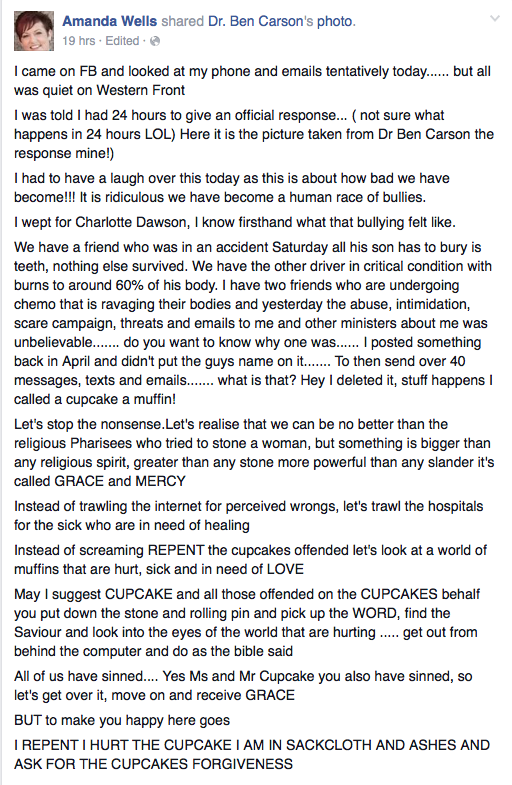 I’m still wondering several days later, just who Mr CUPCAKE is? Amanda’s bogus post had multiple erroneous statements in it. Four of them were…. In this statement, Amanda Wells is wrong on 3 levels biblically, proving she does NOT believe the Bible…. Firstly, the human race has not BECOME a race of bullies nor anything else, according to the Bible the human race WAY LONG AGO fell into complete sin at the point of Adam and Eve. What doesn’t Amanda get about that ??? Secondly, having a ‘laugh over this is about how bad we have become’ has NOTHING to do with ‘how bad WE have become’, this is all about how wrong it is FOR HER to go around attaching God’s Holy Name to her self-deluded messages from Heaven !!! Thirdly, Amanda never believed what the Bible says in Ephesians 5:11 about exposing her wicked works of darkness, like her fake-uh-mundo self-given prophetess title. She takes OFFENSE at BIBLICAL correction. Well, that statement was over-the-top Amanda. In your namecalling statement, you defiantly declare you have NO INTENTION of ever changing. GRACE ??? Here’s what the Apostles Paul and John say about your FALSE APPLICATION (scripture-twisting) of the word “GRACE”, because you cannot use “GRACE” as a cover to continue in your called-out sin…. ROMANS 6:1-2: What shall we say then? Shall we continue in sin, that grace may abound? God forbid. How shall we, that are dead to sin, live any longer therein? 1 JOHN 3:6 No one who lives in him keeps on sinning. No one who continues to sin has either seen him or known him. What an inane childish namecalling insult towards God and His people. That did not come from a repentant heart, it shows how not-seriously she takes this entire matter. It is a BIG JOKE to her. 1 John 1:8 If we say that we have no sin, we deceive ourselves, and the truth is not in us. 9 If we confess our sins, he is faithful and just to forgive us our sins, and to cleanse us from all unrighteousness. * the one/s you stole a lot of original material from on repeated occasions? * the undiscerning followers who who fell for your deception and wasted their time/money on your plagarized material/ appearances online/ in public? * the holy God whose name is belittled and mocked every time an atheist/ non-believer hears of scam artists like yourself? John 8:44 [Jesus said] 44 Ye are of your father the devil, and the lusts of your father ye will do. He was a murderer from the beginning, and abode not in the truth, because there is no truth in him. When he speaketh a lie, he speaketh of his own: for he is a liar, and the father of it. An owning of sin, a complete confession of sin/no excuses for sin to God/ people. Follow Zacchaeus’ example (e.g. paying back four times what he’d ripped off innocent people). The longer you remain biblically unrepentant – the greater penalty you will have to pay for in this life and perhaps the life to come….